This horrifying video of a tumbling airplane is not real. Typhoon Mangkhut has battered Hong Kong and China, millions of people have been evacuated. 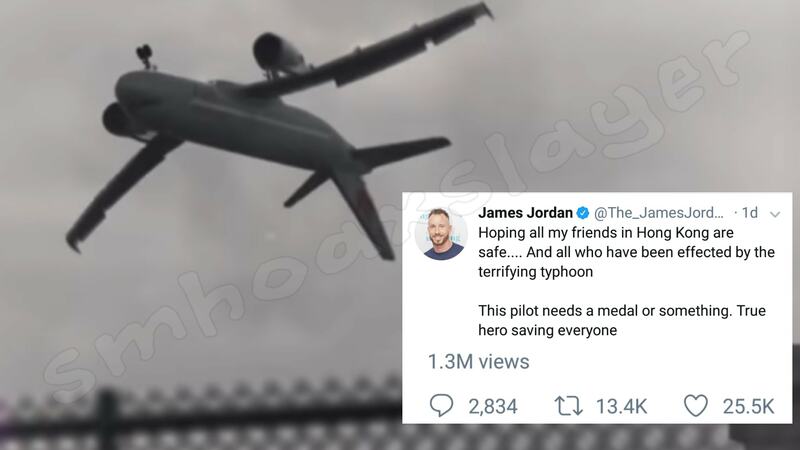 An American actor, James Jordan tweeted a message wishing people in Hong Kong to remain safe but along with it, he also included a video showing an airplane horribly tumbling because of winds but coming down safely, suggesting a medal for the pilot of the plane who handled such tough situation. Millions of people saw the video and by now more than 15000 have retweeted it. ← When people take a satire seriously. Neither are these women, nor did they strip against Modi Ji. A Video Proof of call from the blasting number 777888999 ? ​Shubha wasn’t arested for killing her rapists, she killed her fiancée. मासूम बेटी या शातिर कातिल ?